The Supreme Electoral Committee (SEC) announced Saturday that the newly drafted national charter was approved by 98.1 percent of voters. SEC head Nabil Salib says 38.6 percent (20,613,677) of registered voters cast ballots in last week's referendum on the draft constitution, surpassing the 32% turnout of 2012 constitutional referendum. The number of 'yes' voters according to Salib was 19,985,389. More than 53,423,485 Egyptians were registered to vote in the constitution referendum that took place on 14 and 15 January, according to the SEC. Presidential advisor for constitutional affairs Ali Saleh said shortly after the results were announced that the newly-approved charter was put in effect immediately. The two-day vote also included clashes that led to the killing of at least nine people as security forces and supporters of the Muslim Brotherhood faced-off in several governorates. The newly-approved constitution replaces the one drafted in 2012 by an Islamist-dominated constituent assembly. According to the post-June 30 political roadmap, the referendum will be followed by parliamentary and presidential elections within the next six months. Saleh said, however, the approval of Egypt's new constitution means that previous constitutional decrees by interim President Adly Mansour are void. The 5 July decree dissolved the Islamist-led Shura council while the 8 July decree outlined a transitional roadmap to follow the removal of president Mohamed Morsi, which included the suspension of the 2012 Islamist drafted constitution. "By the annulling of the 8 July decree and the implementation of a new constitution, there is now no specific road map," Saleh told Ahram Arabic news website, adding that according to article 230 of the constitution, it's up to Mansour to decide whether parliamentary or presidential elections will be held first. He said that regardless of which elections occur first, the second elections must start within six months of the ratification of the constitution. Another advisor, Ihab Badawy, to Mansour said the interim president had yet to decide on the timeline for elections and will address the nation on Sunday regarding the referendum. According to Salib, 98.1 percent of Egyptians expatriates have also approved the constitution, with 15.7 percent out of a total 64,000 registered voters participating. Around 40 percent of registered expats voted in the 2012 constitution referendum, with more than 63 percent voting in favour of the charter. Saddam use to get 98% and so would Assad. Not surprised by the official results as its under a coup regime. arab election observors have reporting that real turn out was no more than 12%. So they want us believe that egyptian came in their droves to endorse the coup regime like they wanted us to believe 30million came out protesting against morsi, a claim which was later disproved by independent crowd estimators. Even google reported that no more than a million came to protest against morsi by using their sattelite technology. It's Time To Work Together Egypt! Egyptians have to find their own way! They have no concept of what democracy truly means so how can they be expected to act according? A lot of bloodshed came in the name of democracy in the US before we found our freedom and independence. We fought for everything we have today and so must Egypt. One of the problems Egypt has though is allowing religion to interfere in their greater goals. Religion belongs in the home and heart of the individual, not in government. Not everyone is the same in this world, therefore you cannot govern everyone the same. Leave religion at home and govern for ALL of Egyptians! This is the only way Egypt will ever be truly democratic, inclusive, modern and back on track as one of the greatest civilizations this world has ever known. Stop blaming everyone else for failures, The MB didn't work out so move on, The Jews, Copts and whatever other religions there are there, are citizens just the same and everyone deserves the same treatment, education, benefits and chances until proven otherwise! Holding on to anger and hate brings you down and your family and that is no way to live1. I wish ALL Egyptians the best of luck in this new transition and new era and may ALL of you find your way together! Sorry all you traitors to your country out there. You've lost the game so get over it. The Egytian people have spoken and made their voices loud. The Western media and the MB's mouthpiece Al Jazeera made it seem there were no queues and few voters. We turned on our sets here and saw another Egypt; one with women handing out roses, ulalating, dancing and singing to the refrain of Helwa ya Balady. We felt the excitment and the joy. We saw the street parties and the signs calling for Gen. El-Sisi to run for president. We in Egypt know the truth. So you traitors urging the US to invade or stupidly trying to send Egypt to the ICC are shooting yourselves in the foot becoming more and more hated as each days passes for your bombs and your Molotovs and your AK 47s. Terrorists all, people who love death over life and want death for everyone who doesn't agree with them. May God forgive you on the Day of Judgment for your crimes - because the people of Egypt, the good people, won't. The result of the refferendum is not a reason to celebrate. (1) Less then 50% of eligible voters went to the polls.this proves that Egypt's society is deeply divided. (2) A result of almost 99% approval is suspicious some people will think it is too good to be true . 2011 Referendum, no boycotts, 18.5M votes. 77.2% "yes" 2012 Referendum, no boycotts*, 17.1M votes. 63.8% "yes" 2013 Referendum, MB boycotts, 20.6M votes. 98.1% "yes" *NSF decided to participate and push for "no" 10 days before referendum. All three elections monitored by local and international NGO with no major violations that would alter results meaningfully. Also this time there were 30,000 voting stations as opposed to 12,000 the previous times, hence no lines. Conclusion: Egyptians realized they made a huge mistake with Morsi and MB, now got their country back! The total number of voters in the 2014 referundom is over 20 millions, which is 25 percent more than the 16 millions in 2012. Hence the turnout should be also 25 percent more than the 32 percent 2012 turnout, which brings the current turnout to 40 percent. In addition the expat turnout was significantly and artificially lower than in 2012 due to the mandated absence on mail voting. When this factor is adjusted ( i.e. Substract the number of votes by mail from the 2012 turnout : 300 000 votes) the 2014 turnout of 40 percent is to be compared with a 31.5 percent in 2012. 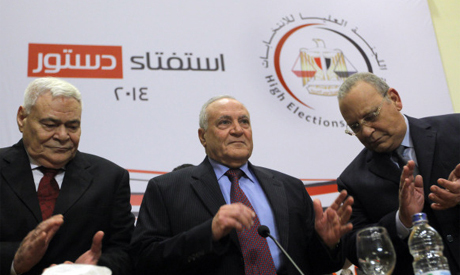 A magnificent victory for Egypt and an ignminious defeat for the hood terrorists : 40 percent turnout and 98.5 perçent approvel for Egypt vs 31.5 percent and 64 percent respectively for the terrorists. Long live Egypt ! Long live free Egypt ! Long live free Egypt from hood terror ! ...especially given the boycott calls. Egypt's getting along very fine! Felicitations! I do agree with you especially given the democratic climate and human rights that reins in Egypt during the referendum. There were 12,000 voting stations in 2012 and 30,000 this time. That's why they were empty and fast. Such ignorant people!! this is the climates joke.. laugh all world. well done sisi..